March 15, 2018 – IK Multimedia is pleased to announce the immediate availability of the brand-new and unique Total Studio 2 MAX bundle, the world’s most complete studio collection of software instruments and FX. It brings together an amazing 94 products in one single suite for Mac/PC and equips composers as well as engineers, creative sound designers, producers, performers, multimedia artists, broadcast professionals, and others with everything they need to be inspired and to take their music making and audio processing to a new level. From full orchestral arrangements for TV, cinema and video games to complete, polished mixes and masters, ready for distribution, as well as full-blown tracks in any style and genre, everything is within easy reach. Total Studio 2 MAX and its entry-level version, Total Studio 2 DELUXE, are now available for purchase today. Total Studio 2 MAX contains 43 virtual instruments, almost 17,000 sounds and 179 GB of samples amongst which there are 7,000 acoustic instrument sounds to suit any musical style or genre as well as a stunning 3,000 orchestral sounds with articulation switching for incredible expressiveness. These put the sounds from the uniquely musical Miroslav Philharmonik 2 at composers’ fingertips and give the tools for the perfect score. Miroslav Philharmonik’s soul was first masterfully captured by the legendary Miroslav Vitous at the prestigious CNSO Studios in Prague, where the soundtracks for The Hateful Eight, The Young Pope, The Illusionist and many other blockbusters have been recorded. To guarantee the ultimate ease of use, all sample-based sounds can be accessed, browsed and combined within the single SampleTank interface which allows for the creation of quick and easy multitimbral productions from Rock, Pop, Hip-Hop, EDM, Trap, Jazz, House and more, there is no limit to the style. The industry-standard SampleTank MAX, IK’s complete sound and groove workstation, itself comprises 24 libraries, 4,600 instruments, 7,400 drums and loops and 3,500 MIDI patterns. These sounds are far from ordinary: they have been carefully assembled and recorded by IK’s experienced recording engineers with high-quality instruments played by professional musicians in some of the world’s finest studios. Most importantly, SampleTank 3’s powerful editing and effects features make it possible to control every aspect of these sounds, which allows for an unparalleled creative sonic experience and satisfies the needs of even the most demanding music producers. Furthermore, Total Studio 2 MAX adds the break-through physically modeled iconic instruments from MODO BASS into the bundle, incorporating the widest assortment of electric bass sounds for unmatched expressiveness. MODO BASS utilizes a completely new technology where sound is generated by recreating the physical properties of a real bass, no samples are used, and it recreates virtually every electric bass sound imaginable delivering an unprecedented realistic performance for any bass track. In addition, Total Studio 2 MAX comprises over 4,000 electronic instrument sounds including hybrid sample and modeling synths. From the undeniably authentic sound of legendary synthesizers and string machines to the driving power of world-class effects, IK’s Syntronik offers the definitive and best-sounding collection of vintage synthesizers in a virtual instrument. It includes 17 amazing instruments with over 2,000 preset sounds covering a wide selection from 38 of the most iconic to ultra-rare and painstakingly multi-sampled vintage synthesizers. Syntronik’s synthesis engine goes well beyond traditional sampling thanks to a brand new analog modeled filter section created with the utmost expertise from IK. All of this coupled with exclusive DRIFT™ technology to accurately reproduce the behavior of oscillators from real hardware synths makes it the ultimate source of inspiration with the widest palette of synthesizer sounds ranging from exact reproductions of the originals to sounds never heard before that will stand out from the crowd in productions covering any genre and style. 39 individual, high-end mixing and mastering processors from the industry-leading T-RackS 5 MAX workstation and the acclaimed Lurssen Mastering Console are available as single plug-ins or within a single mix and mastering chain, supporting up to 192kHz sample rate. T-Racks 5 MAX is the most powerful mix and master modular system on the market and includes all the necessary tools from EQs & channel strips, dynamics, reverb & effects, harmonics processors to special processors/metering. Lurssen Mastering Console, the official emulation of the multi-GRAMMY® award-winning Lurssen Mastering, Inc. mastering console even further enhances the mastering power packed into Total Studio 2 MAX. Also included is a unique album assembly feature with sequencing and metadata embedding. It’s fast and intuitive and enables the assembly of full-length productions directly within the T-RackS interface. Total Studio 2 MAX offers the largest and most authentic collection of guitar and bass gear available with over 350 coveted circuit-modeled amps, cabinets, mics, stomp effects and rack effects. They include official models of iconic world-class brands such as Fender®, MESA/Boogie®, Ampeg®, Orange®, Fulltone®, Soldano®, ENGL® and more, and span the range from the essential bread and butter models to the most sought-after rarities which most could otherwise just aspire to own. Everything in Total Studio 2 MAX utilizes the most sophisticated industry standard and IK’s proprietary technologies to always ensure the highest sound quality and musicality, true to IK Multimedia’s mission to putting musicians’ needs first. All products can be easily used both as standalone applications and plug-ins for AU, AAX and VST. The entry-level version, Total Studio 2 DELUXE, with over 9,700 sounds, 12 powerful virtual instruments, 22 mixing and mastering processors and over 140 guitar amps and FX, is aimed at musicians, composers and producers who need a comprehensive collection of creative and specialized tools for their studio, striking the right balance between features, flexibility, variety and power, all at an incredibly affordable price. Total Studio 2 DELUXE comprises 35 products including AmpliTube 4 Deluxe, T-RackS 5 Deluxe, SampleTank 3, Miroslav Philharmonik 2 and more. All of the Total Studio 2 Upgrade, Maxgrade and Crossgrade titles are offered at a special introductory price of 20% off from March 15 until April 30, 2018. Total Studio 2 MAX and Total Studio 2 DELUXE are immediately available for download from the IK Multimedia online store and from select retailers worldwide. The boxed versions with a USB flash drive are open for pre-orders at the same corresponding prices** and will commence shipping in April. Antelope Audio’s talented team of engineering experts, led by capable company CEO Igor Levin, designed DISCRETE MP to perfectly match the frequency response of the already-available, trailblazing EDGE, a large-diaphragm modelling microphone featuring dual edge- terminated capsules for a smooth/natural sound, reproducing the expressiveness and character of costly classic microphones — albeit without excessive expense. Elsewhere, the EDGE Strip-bundled DISCRETE MP dual-input microphone preamplifier places the same transistor schematic that beats at the state-of-the-art heart of the aptly-named DISCRETE 8 ThunderboltTM & USB Interface with 8 Discrete Mic Preamps and DISCRETE 4 ThunderboltTM & USB Interface with 4 Discrete Mic Preamps series siblings — released to critical acclaim late last year — at its user’s fingertips. Furthermore, the EDGE Strip bundle comes complete with the free native-format Fusion AFX Pack plug-ins, including several microphone and preamp emulations alongside the BA 1073 EQ (inspired by the Seventies-vintage channel module with a specific analogue punch putting in an appearance on many notable recordings) and STAY-LEVIN compressor (personally designed by Igor Levin at Antelope Audio to capture the spirit of its historic hardware namesake that shaped the special sound of a slew of Sixties Stateside classics). Clearly, then, the days of spending tens of thousands of dollars on a vintage mic collection are over, thanks to those must-have microphone emulations: BERLIN 47 FT allows authentic access to the sound of one of the most popular microphones in the history of audio recording; BERLIN 67 carries with it the true sound of an iconic tube condenser microphone with multiple — cardioid, omni, and figure eight — polar patterns, popularised as a result of its signature sound and adaptability; BERLIN 87 is the go-to microphone when it comes to recording brass sections, guitars, overheads, piano, percussion, strings, and vocals; and TOKYO 800T, a vintage tube mic with a super-low noise floor and extreme sensitivity that is a top choice for many masters of vocal recording. Reality bites still further with ANTELOPE V76, GIRAFFE G9, and BAE 1073 MP preamp emulations par excellence. Evidence has it that Antelope Audio has always collectively prided itself in coming up with technologies that unite the digital and analogue audio worlds. While both DISCRETE MP and EDGE are all-analogue devices, making them fully compatible with any audio interface and A/D converter central to any studio setup anywhere, DISCRETE MP allows users to explore the full potential of EDGE in both Antelope Audio– centred setups or other audio systems. Saying that, thanks to its 1kHz hardware calibration OSC (oscillator), DISCRETE MP easily adapts to any studio setup. Still deeper, DISCRETE MP masterfully makes available Antelope Audio’s signature sonic footprint of pristine audio quality. The unique discrete design of its preamp allows Antelope Audio to modify each individual aspect of the preamp, putting total control over colouration, clarity, and character in the hands of discerning users. 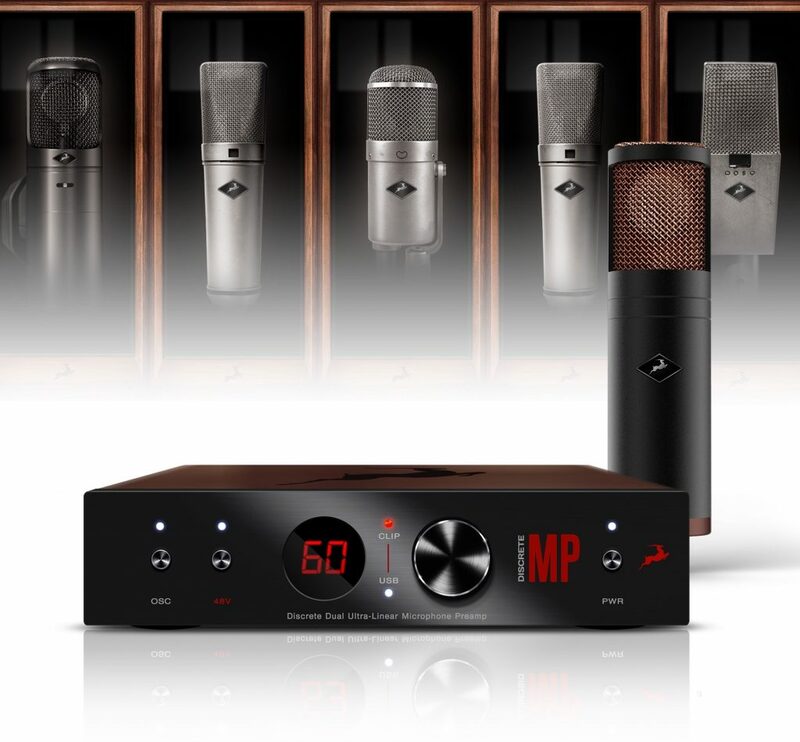 Ultimately, DISCRETE MP powerfully punches well above its (950g) weight while packing a lot into its diminutive (190mm W x 46.5mm H x 157mm D) dimensions, as evidenced by its impressive technical specifications: two INPUTS on MIC-XLR and LINE-USE 1/4” JACK, offering 20dBu max balanced @ 2kΩ (XLR only) and 29dBu max balanced @ 13K to ground (TRS only); two TRS OUTPUTS (22dBu max); USB CONTROL I/O (USB 2.0 Full-Speed Type B for remote control only); and a mic preamp pushing out an accomplished gain range of 0dB to 61dB (in 1dB steps) alongside 48V phantom power. The musicians that Spitfire Audio collectively chose to work with when creatively crafting ALTERNATIVE SOLO STRINGS really represent some of the most exciting and in-demand players on the London orchestral session circuit. Collaborating with many of the biggest recording artists in the world to Oscar award-winning movie score performances, there can’t be many major British recordings in existence that haven’t featured these major players in some shape or form! Frankly speaking, top violinist and musician Warren Zielinski, award-winning viola player Joel Hunter, professional cellist Chris Worsey, and leading UK double-bass player Mary Scully take some surpassing, having amassed an amazing collection of ‘onscreen’ collective credits between them, including: Captain America (Henry Jackman), Fantastic Beasts And Where To Find Them (James Newton Howard), Victoria & Abdul (Thomas Newman), Jason Bourne (David Buckley/John Powell), Interstellar (Hans Zimmer), Sherlock Holmes: A Game Of Shadows (Hans Zimmer), Inception (Hans Zimmer), Tinker Tailor Soldier Spy (Alberto Iglesias), The Twilight Saga (Carter Burwell), Batman Begins (Hans Zimmer/ James Newton Howard), Gladiator (Hans Zimmer/Lisa Gerrard), Lord Of The Rings: The Fellowship Of The Rings (Howard Shore). Meanwhile, musically Nick Cave, Daft Punk, Mark Ronson, UNKLE, Badly Drawn Boy, U2, Goldfrapp, Joni Mitchell, Max Richter, The Divine Comedy, and Christine and the Queens have all benefitted from the aforesaid players’ perfect performance touch(es). 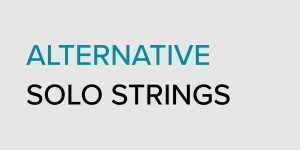 That all being said, the resulting ALTERNATIVE SOLO STRINGS collaboration creates and adds Double Bass and Viola to Spitfire Audio’s previously-released PP015 ARTISAN CELLO and PP016 ARTISAN VIOLIN libraries, all rewrapped with a new interface and KONTAKT PLAYER compatible — and also Spitfire Audio’s first double-bass library to boot! Better still, all of these instruments carry with them the signature sound of Spitfire Audio — all artfully designed to provide not only that initial spark of inspiration but also broaden understanding of this particular group of instruments. Indeed, Spitfire Audio always prides itself on making precision tools for composers that deliver effectively on the current demands of the industry alongside a deeply-held belief that creating a series of raw, edgy tools that behave with a certain amount of realistic unpredictability leads to the most exciting results. 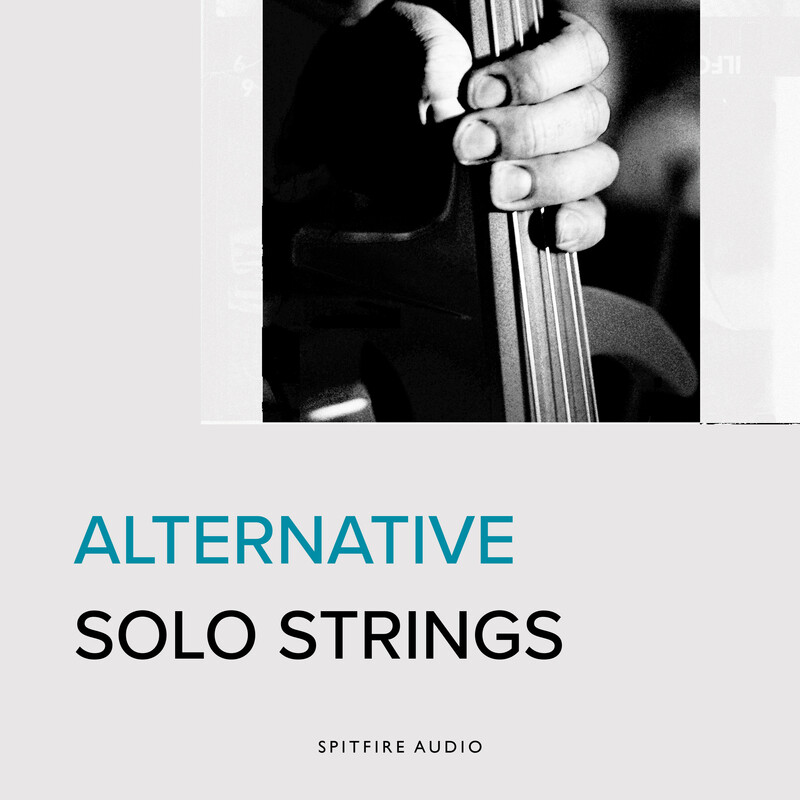 Recorded at the Spitfire Audio HQ’s ultra-high-spec in-house recording studio and tracked there through the finest equipment, as a result, ALTERNATIVE SOLO STRINGS provides perfect accompaniment to Spitfire Audio’s popular LONDON CONTEMPORARY ORCHESTRA STRINGS, which was recorded in the same location. Let it be said, then, that whilst the spirited and sometimes unpredictable recordings may well pleasantly lead its user into unexpected territory, the sonics of Spitfire Audio’s dry stage provide ultimate control — whether that be an upfront Warren Ellis-style approach, a hyper-produced Hans Zimmer-style overdub on top of a large orchestral bed, or, indeed, a virtuoso performance within the section of a chamber work. ALTERNATIVE SOLO STRINGS needs Native Instruments’ free KONTAKT PLAYER (5.6.8) — included in the purchase — to run as a fully NKSTM (NATIVE KONTROL STANDARD) supporting plug-in instrument for Mac (OS X 10.10, 10.11, or macOS 10.12 — latest update) or Windows (7, 8, or 10 — latest Service Pack, 32/64-bit), while Spitfire Audio’s free Download Manager application allows anyone to buy now and download anytime. Thanks to Pittsburgh Modular Synthesizers’ new temperature-stabilised, dual-VCA (Voltage Controlled Amplifier) oscillator core, the analogue audio engine of the Microvolt 3900 feeds a set of timbral wave-shapers carefully crafted for deep harmonic shaping, allowing a layer of additive synthesis alongside the classic synthesis waveforms. Waveforms are fed into the binary filter, a custom state-variable filter architecture allowing for near-infinite resonance — with or without self- oscillation. Sonically speaking, this creates a juicy, fluid filter, adding depth and energy to the oscillator that can capably scream on demand! Deeper still, Pittsburgh Modular Synthesizers’ new dynamic vca lies at the heart of the Microvolt 3900’s sound world. Whereas a standard VCA works in two dimensions, the dynamic vca technology adds a third dimension — duly welcomed. When the dynamic vca closes, decreasing the amplitude, harmonics are removed from the source; whereas when the dynamic vca opens, the harmonics are restored. Reality dictates that this mimics the behaviour of sounds in nature. Needless to say, the result is a lively, organic-sounding synthesizer, full of energy. The design of the dynamic vca also allows the instrument to be plucked or struck, so-to-speak, opening up another set of musically percussive possibilities. Putting more sonic architecture into its intrepid users hands, the semi-modular Microvolt 3900 includes a 39-point Eurorack format-friendly 1/8-inch jack patchbay for complete signal routing control over a full complement of audio and modulation options with several self-explanatory sections clearly categorised: clock, external, midi, output, waveform generator, envelope, filter, vca, modulation, function, and inverting mixer / splitter / offset. On top of that, a highly-tuned, four-stage (attack, decay, sustain, and release) envelope generator; multitasking function generator (which works as a voltage-controlled envelope, LFO, and oscillator); wide-ranging lfo (Low Frequency Oscillator); chaotic random source (random complexity); multi-mode sequencing arpeggiator; and MIDI-to-CV (Musical Instrument Digital Interface to Control Voltage) control are also available to create dynamic sounds unique to the Microvolt 3900. With concluding crowning additional achievements including a voltage-controlled, West Coast-style wavefolder (fold timbre); switchable harmonic sine wave; external preamp with 30 independent gain and output level controls; classic Pittsburgh Modular Synthesizers lowpass filter with extended resonance; dynamic vca with standard vca and lpg (Low Pass Gate) modes; variable overdrive on output; chaotic (random) rnd cv and rnd gate generator; and that 39-point Eurorack format-friendly patchbay… put it this way: with the feature-packed Microvolt 3900 Pittsburgh Modular Synthesizers is definitely destined to delight desktop synthesizer supporters anywhere as a modern, semi-modular synthesizer inspired by the instruments designed by the company’s heroes, though taking a new approach to building a contemporary analogue monosynth with a host of innovative and unconventional features that makes it stand out from the sound of the crowd! 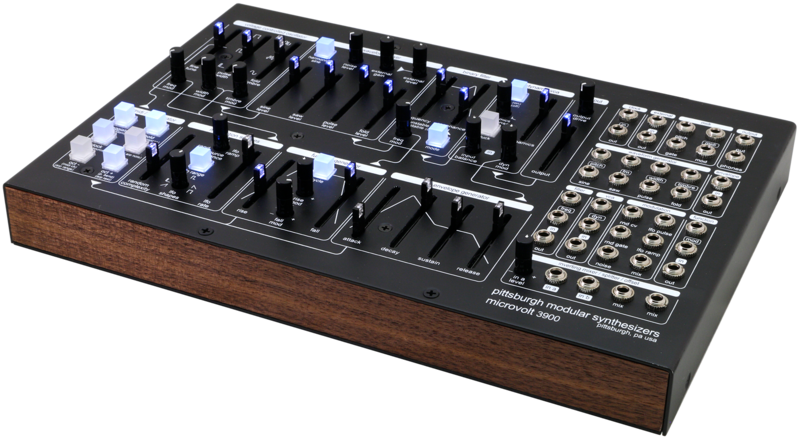 The Microvolt 3900 is scheduled to ship to Pittsburgh Modular Synthesizers’ growing global network of authorised dealers and resellers (https://pittsburghmodular.com/dealers) on April 27, 2018, when it will become available to purchase with an RRP of $629.00 USD. That’s today. Putting PolyM in its present-day context involves initially looking back. But back in the early-Seventies, setting out to create an analogue, functional voltage-controlled synthesizer that was polyphonic against a backdrop of monophonic mainstays proved problematic for many. Moog’s musical solution came quicker than most, making an appearance in 1975 in its extremely expensive ($5,295 USD), nine-preset original form as the Polymoog keyboard (model 203a). It included a front panel packed with an almost continuous row of slider pots (permitting presets to be fully modified into more individualised analogue sounds via various subtractive synthesis parameters, including a 24dB Moog ladder filter section — allowing modulation modulated from its own envelopes and low frequency oscillation — alongside a unique and flexible three-band resonant filter section with lowpass/bandpass/high-pass filter modes) before being joined in 1978 by a marginally more economically-viable ($3,995 USD), 14-preset stripped back version (with editing reduced to volume, tuning, high-pass filtering, and basic LFO — Low Frequency Oscillator — features), which was also (confusingly) called the Polymoog keyboard (model 280a), though the original fully-variable version was then rebadged, admittedly, as the Polymoog Synthesizer. Saying that, unlimited polyphony united the two innovative instruments in question, albeit unlimited in the sense that all 71 notes of their weighted touch-sensitive keyboards (capable of being split into three sections, each with independent volume control) could sound simultaneously, but based on divide-down oscillator technology — similar to electronic organs and string synthesizers of the time — to generate all notes and pitches using a small number of fixed-frequency oscillators as an alternative to ‘traditional’ VCOs (Voltage-Controlled Oscillators). 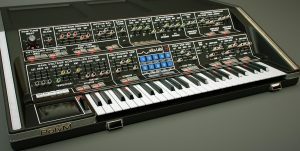 Obviously, the Polymoog cannot create each voice from individual oscillators and filters, nor store sounds programmed by the user — unlike the first generation of microprocessor-controlled designs that soon followed suit, such as Sequential Circuits’ classic Prophet-5, the world’s first fully-programmable polyphonic synthesizer — as a result. Regardless of those limitations and reliability issues inherent in its complicated, convoluted design downfall, some notable users still shaped some stunning-sounding records using the pioneering Polymoog. Prime example… as an innovative individual almost alone in seeing the opportunity for a star of synth-based music, a futuristic-looking Gary Numan notably ‘drove’ over an endless Polymoog landscape in the pioneering promo video for his 1979 chart-topping ‘Cars’ single and arguably opened the floodgates for the wave of (mainly British) synth-pop acts that trailed in his wake. Wisely — and appropriately — once observed: Gary Numan’s classic breakthrough, The Pleasure Principal, is almost an album-length advert for the Polymoog. Those beautiful, stark, synth-strings frozen all over the songs is the Polymoog’s Vox Humana preset. 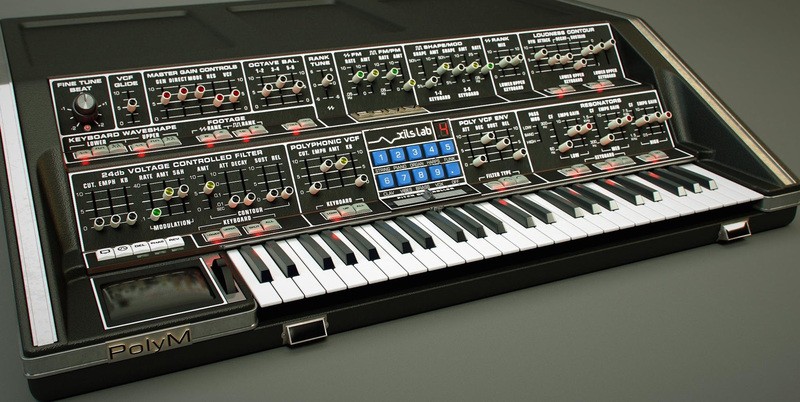 Fast-forward, then, to two years ago, and XILS-lab clearly considered those oft-overlooked Polymoog presets to be well worth revisiting, recreating an ‘unlimited’ polyphony polysynth that was recognisably revolutionary upon its initial release and making it fit for today’s creative computer-based music-makers with a state- of-the-art software makeover. Making that happen was easier said than done, however — hence that two-year development time. That equalled the same time taken to develop the original, overly-engineered historical hardware from which it drew its innovative inspiration, ironically — hardly surprising, given that the Polymoog uses a TOS (Top Octave Synthesizer) system with a TOG (Top Octave Generator) chip to create a bank of 12 square waves representing the top octave of the keyboard, each of which are then passed through a divider chip to create all the lower octaves, and can then be processed to create other wave shapes; making matters more complicated, the Polymoog has two sets of TOS chips, generating two wave shapes (pulse and sawtooth) per key — two oscillators per key, effectively. There are also two envelope generators, two VCAs (Voltage-Controlled Amplifiers), and two fixed filters for each key. Those circuits are combined into a custom chip called the Polycom, mounted on a small card, and there is one Polycom card per key. That all adds up to a whole lot of circuit boards in one cumbersome keyboard…. little wonder, then, that reliability became an issue! In there is what counts, though, and PolyM palpably doesn’t disappoint… deftly reproducing yesteryear’s divide-down technology with two TOD (Top Octave Divider) oscillators — one for the sawtooth wave and another for the square, slightly detuned for a phenomenal phasing effect (when running independently in FREE mode), yet these take the concept further forward by adding polyphonic pulse width modulation. Meanwhile, in LOCK mode, those two TOD oscillators are almost locked in phase, producing PM (Phase Modulation) instead of FM (Frequency Modulation) when the square wave oscillator is modulated in pitch. The two TODs can also be modulated — tempo-sync-able — in pitch by an LFO, while the square wave oscillator has it own pulse width modulation by a tempo-sync-able LFO. Alongside a distinctive envelope generator, this represents the musical heart and soul of PolyM, pushing that revolutionary polysynth sound kicking and screaming into the future! More than 260 presets are available to help users get going and all parameters are MIDI-controllable, combining to position PolyM as an innovative instrument of its time while retaining the one-time pioneering Polymoog’s performance properties. Put it this way: while what Austrian neurologist and founder of psychoanalysis Sigmund Freud would have made of it is obviously open to speculation, surely Gary Numan should approve… as will anyone’s bank balance by paying (comparatively) so little for so much playing pleasure! Perhaps PolyM pushes beyond the pleasure principal? “No composer contributed more to film than Bernard Herrmann, who, in over fifty scores, enriched the work of such directors as Orson Welles, Alfred Hitchcock, François Truffaut, and Martin Scorsese.” So stated Bernard Herrmann biographer Steve C. Smith. So when the opportunity arose for Spitfire Audio to collaborate with his estate, excitement throughout the cutting-edge company co-founded by working film composers was understandably palpable. So how, exactly, did the steadfast Spitfire Audio team set about recording what would become BERNARD HERRMANN COMPOSER TOOLKIT? Well, working exclusively with The Bernard Herrmann Estate to curate and assemble a unique set of studio orchestra ensembles informed directly by a legendary orchestration aesthetic, all duly decamped to Studio 1 within London’s legendary AIR Studios — complete with its unique AIR-custom Neve/Focusrite large-format mixing desk with 72 channels incorporating original ‘AIR Monserrat’ mic preamps and GML automation, alongside a 140m2 fully-floated floor live room capable of accommodating up to 45 musicians — in the capable company of Abbey Road Studios Senior Engineer Simon Rhodes — who has a longstanding association with various composers, including the late James Horner whom he worked with for 18 years on over 40 projects including Avatar, the highest grossing film of all time — to capture players performing as Bernard Herrmann himself would have done had he still been working today… boisterous, lively, and upfront. Unusual instrumental combis, selected groups, chords, effects, and much more are the supremely sampled order of the day with BERNARD HERRMANN COMPOSER TOOLKIT, tasty musical morsels served up in an easily accessible form from within Spitfire Audio’s already-familiar GUIs (Graphical User Interfaces) and organised as follows: STUDIO ORCHESTRA; HIGH STRINGS; HIGH STRINGS OCTAVES; HIGH STRINGS HALF SECTION; LOW STRINGS; LOW STRINGS AND HORNS; LOW STRINGS AND TROMBONES; PICCOLO AND FLUTES; CONCERT FLUTES; MIXED FLUTES; FLUTES AND CLARINETS; COR ANGLAIS, CLARINET, AND TRUMPET; OBOES, BASSOONS, AND HORNS; TRUMPET AND XYLOPHONE; HORNS; MID BRASS; TROMBONES; TROMBONES AND TIMPANI; HARP AND CELESTE; HARP AND VIBRAPHONE; ONDES MARTENOT; PERCUSSION; TIMPANI; and SYNTHS. Speaking of the latter, included in the ‘advanced’ folder are over 30 patches inspired by Bernard Herrmann’s use of synthesisers in combination with orchestral material, all of which can be controlled using Spitfire Audio’s Mercury Synth GUI, an ingenious interface initiating instant interaction without forcing users to delve deep under the KONTAKT hood; helpfully, all controls are assignable to (compatible) control surfaces, so users can quickly make Spitfire Audio’s synth sounds their own with minimal fuss. Much fuss has been made about Bernard Herrmann, however. And deservedly so since he is one of the great modern composers, after all. His work for TV and film is nothing short of iconic, and truly synonymous with mid-20th Century cinema. Collaborating with Orson Welles on Citizen Kane (1941), Martin Scorsese on Taxi Driver (1976), and in longterm partnership with Alfred Hitchcock on scores such as Vertigo (1958), Psycho (1960), The Birds (1963), Marnie (1964), and beyond, the sheer magnitude of critical works is breathtaking. But not only did his work have a significant impact on popular culture at the time, more recently those works have been used to invigorate contemporary scores, such as Quentin Tarantino’s twist on the Twisted Nerve theme in 2003’s Kill Bill, 35 years after its inception — an eerie whistle which is now instantly identifiable worldwide. But Bernard Herrmann demonstrated a unique and trailblazing compositional style throughout his celebrated career. His orchestrations were entirely original, daring, and inventive — albeit always appropriate for the context, so subsequently incredibly influential in film scoring. Psycho — famed for its strings-only approach — is an obvious example of a totally new way to score a thriller. The bold selection of specific instrumental ensembles — the infamous Torn Curtain featured 12 flutes, for instance — and choice of interesting combinations — harp and vibraphone in Vertigo; stopped horns and pizzicato strings in North by Northwest (1959) — challenged the status quo. Equally, experimenting with electronic instruments in scores — the Ondes Martenot in The Day The Earth Stood Still (1951) and amplified Moog synths in 1972’s Sisters and Endless Night — brought with them sounds previously unheard in cinemas. However, Herrmann also went as far as to affect change in the performance style of players, requesting that they did not play in the then-traditional, somewhat overblown nature that other Hollywood composers of the time tended towards. Outside of his innovative scoring for film for which he remains best known, Herrmann had boundless curiosity and a genuine love of new music, championing the names of several composers who became household names as a result of his hard work as a conductor. As Chief Conductor to the CBS Symphony Orchestra, and the many radio broadcasts he made with them, he helped bring a huge variety of often little-heard music to the masses. 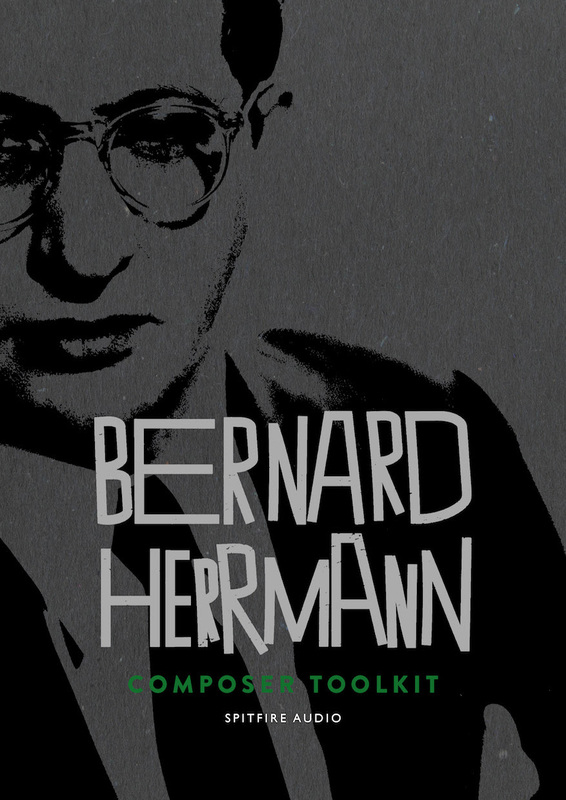 Note that BERNARD HERRMANN COMPOSER TOOLKIT needs Native Instruments’ free KONTAKT PLAYER (5.5 and above) — included in the purchase — while Spitfire Audio’s free Download Manager application for Mac or PC allows anyone to buy now and download anytime. Berlin, June 27, 2017 – Native Instruments today releases STREET SWARM, a new MASCHINE Expansion packed with the razor-sharp acoustic drums, sliced 70s cinemascapes, vintage funk instrumentation, and raw grooves that typified the sound of 90s New York hip hop. A crate digger’s dream, STREET SWARM was specially designed to follow the approach of pioneers like Wu Tang Clan’s RZA, who often searched for obscure samples from old movie soundtracks. In early 90s New York, hip hop swarmed from the underground onto Main Street. Raw and unpolished, it crackled with boom-bap drums. Sonic textures from old soundtracks merged with funky bass lines and dusty pianos. Single-note psychedelic hits danced between disjointed vocal stabs. With that in mind, grammy-nominated sound designer and producer Snipe Young created a plethora of small musical scenes inspired by blaxploitation films of the 70s. These soundtracks – by renowned composers like Curtis Mayfield, Isaac Hayes, Sun Ra, and Herbie Hancock – contained funk and soul grooves sought after by the hip hop producers in 90s New York. Staying true to the genre, Snipe created intricately orchestrated samples chopped to emulate the SP-1200’s loose editing. From romantic string interludes and triumphant horns, to sinister melodies, dirty bass phrases, and energetic drums, STREET SWARM is full of undiscovered gems, waiting to be sliced and crunched in that classic style. STREET SWARM also includes bass guitar, electronic keyboard, horn and retro synth stabs and licks organized by key, so hip hop producers and musicians can play their own melodies. Producers who want to add texture and flare to their creations can also utilize the included FX macros to create something sonically different that matches their own style. STREET SWARM runs in the latest version of MASCHINE software on the entire MASCHINE hardware family, and is available exclusively at the NI Online Shop. A compact version of STREET SWARM is also available as an iMASCHINE 2 Expansion, for sketches on the go. 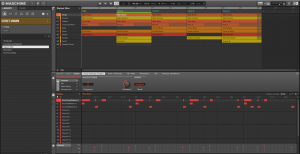 Tracks can be exported to MASCHINE STUDIO, MASCHINE JAM, MASCHINE, and MASCHINE MIKRO for completion. STREET SWARM is available now at the NI Online Shop for $49 / 49 € / £44 / ¥ 6,280 / AU$ 79 and runs in the MASCHINE 2 software. Hollywood, CA (June 26, 2017) – This fall EastWest/Quantum Leap will release Hollywood Choirs. Produced by Doug Rogers and Nick Phoenix, Hollywood Choirs is the epic follow-up to 1999’s Voices of the Apocalypse and 2005’s Symphonic Choirs, the best-selling and most awarded virtual choir of all time. 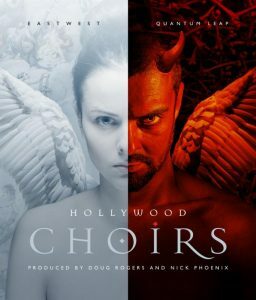 Hollywood Choirs gives voice to a new generation of powerful cinematic vocals with unprecedented dynamics and shocking realism that unleashes a new world of choral possibilities. It features a new and improved WordBuilder plugin that allows the composer to type in any words in any language and have them be sung by the full choir or the individual male and female sections. Hollywood Choirs will be available for purchase and as a free addition for ComposerCloud subscribers this fall 2017. EastWest has been dedicated to perpetual innovation and uncompromising quality of sample libraries and virtual instruments for more than 29 years, setting the industry standard as the most critically acclaimed sound developer. Find more about EastWest at soundsonline.com.